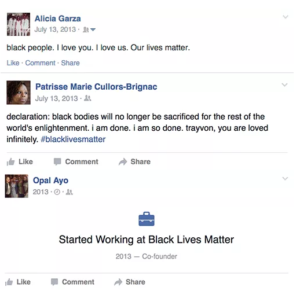 Where were you when you first heard the words “Black Lives Matter”? It’s probably around the same time you heard that George Zimmerman, the officer who fatally shot 17-year-old Trayvon Martin was acquitted of all charges. The global community reacted with shock, rage, and grief as no one was left to answer for Martin’s premature death. A devastated Alicia Garza took to Facebook to write was she describes as a “love note to black people” to remind them of their worth. Friend and fellow-activist Patrisse Cullors followed up with the hashtag that would change the direction, and overall conversation of the string of black men, women, and children who were being killed by officers in a series of should-have-been routine police stops. 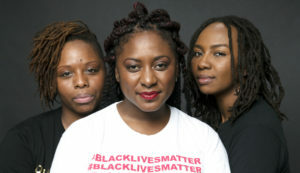 Describing the founding trio as “two queer women and the daughter of Nigerian immigrants,” in an interview with USA Today, Alicia Garza highlights the inclusive nature of the movement. “Black Lives Matter affirms the lives of Black queer and trans folks, disabled folks, Black-undocumented folks, folks with records, women and all Black lives along the gender spectrum. It centers those that have been marginalized within Black liberation movements,” the trio states on Black Lives Matter.com. Despite accusations of the pro-black lives movement being anti-police or racist the adoption of the phrase other oppressed groups like #brownlivesmatter and #translivesmatter shows that its intended message is being received. 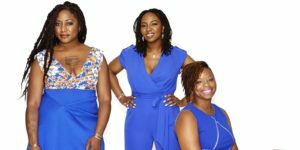 Indiviudually, Alicia Garza works as Special Projects Director for the National Domestic Workers Alliance in Oakland, CA. Patrisse Cullors is Executive Director & Founder of the Coalition to End Sheriff Violence in L.A. Jails. And immigrant rights activist Opal Tometi acts as Executive Director at the Black Alliance for Just Immigration. Today marks the 5th anniversary of Trayvon’s tragic death – and the acquittal that spawned a movement. Since Trayvon’ murder, George Zimmerman has been arrested 7 times.